The police budget for 1978 was only half of what it had been the previous year. This was because the treasury had been robbed and the subsequent investigation was thwarted by limited resources. The thieves were never apprehended. 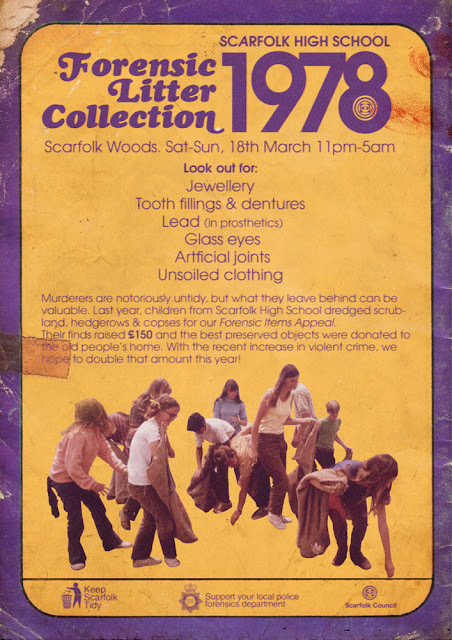 Violent crime soared, particularly recreational parricide, and Scarfolk's woodlands, wastelands and canals were strewn with bodies and body parts. The police, overwhelmed by the sheer number of cases and keen to deflect any criticism, claimed that the problem was not one of unsolved homicide but of littering and blamed any failings on the Keep Britain Tidy campaign. The two eventually agreed to pool resources and turned the task of forensic crime scene examination over to the community, children in particular. 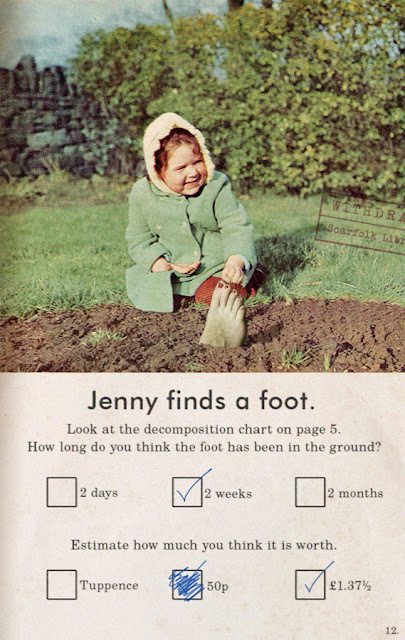 Much like the children's TV programme Blue Peter, schools launched charity appeals that encouraged pupils to collect victim debris, organic or otherwise, to raise money (see leaflet above). In 1978 children across the country collected nearly £9000 worth of gold fillings and 525 glass eyes, among other items. Some were cleaned and reconditioned for further use. Homicide litter recycling became so popular in the late-70s that some overly-enthusiastic people tried to donate whole family members before they had passed away, but the rules were quite strict: donations could only be accepted if the person was murdered first. To this end, the police helpfully released a pamphlet describing those methods which were most likely to avoid detection. Brings back fond memories of similar multi agency initiatives from my child hood. I could never forget Learning to Swim with Rolf Harris and recovering oil covered coastal wildlife after a petrol tanker collided with my hometown's harbour wall. A real sense of community reverberated through the town. Scarfolk Council once again forward thinking in these times of austerity. Nuthin' but genius. I love it. Hip replacements how much are they worth, and artificial legs.